Casino Cruise is the latest online casino to be added to our list of recommended casinos, this casino is fairly new offering having been founded in 2014 but with staff with years of experience in the industry. 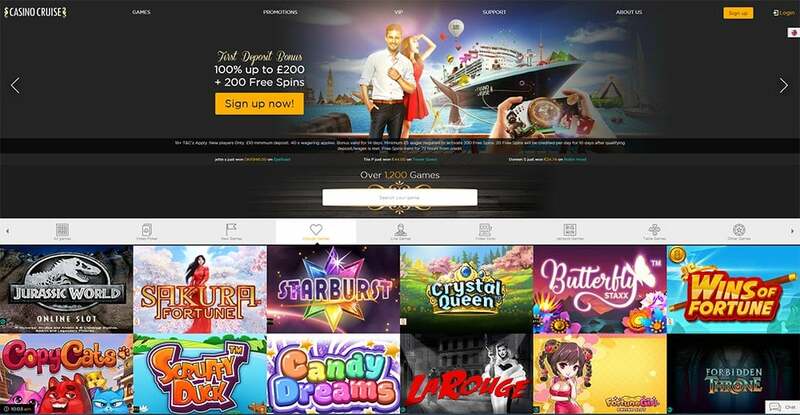 Over this short period, they have grown very quickly and now offer both an impressive range of online slots as well as lots of great promotions, bonuses, as well as a great loyalty point scheme too. There is an abundance of offers for both new and existing players at the casino, so many in fact we will be covering all the extra bonuses and offers in another article! Casino Cruise provides both a fully functional Desktop (browser based) and Mobile Casino which used to operate on the EveryMatrix platform but has recently secured their own UKGC (UK Gambling Commission) license which covers their sister sites Spinit Casino and the recently launched Sloty Casino too. On top of this you will find an MGA (Maltese Gaming Authority) there is even a Curacao license too, so you are in good hands in terms of being covered if you do encounter any issues and you can rest assured you are playing at a safe and fair online casino. The current Welcome Bonus Package for 2017 is a £1000 + 200 Free Spins which includes a first deposit bonus of 100% up to £200 with 200 Free Spins on Starburst along with 3 more deposit based bonuses waiting to be claimed. 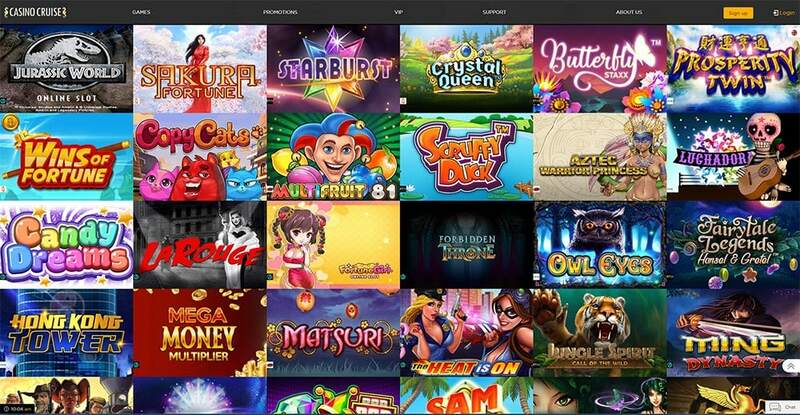 The main selection of online slots at the casino are the usual big providers such as Microgaming and NetEnt as well a great selection from Play’n Go and Nextgen, with several other smaller slot operators also on offer via the NYX platform. Casino Cruise seem to be doing a great job in getting all the latest releases added to the casino promptly, at the time of writing all the major releases from these providers are all live and playable in the casino. Given the impressive range of online slots, Casino Cruise has matched this with a wealth of filtering options for their slots ranges including our personal favourite “Filter By Provider” option, more of the regular filters such as New Slots, A-Z, Z-A etc and of course, the regular text search field if you already know exactly which slots you want to play and what they are called. Along with the huge range of online slots, there is also a decent table games section, which includes the usual BlackJack, Roulette and Video Poker, and other popular table games as well as a recently added live casino on offer too if that is your preference. Customer Service is handled well at Casino Cruise, all of the information you require can be found on the right-hand side of the casino, this includes a very comprehensive FAQ section, Live Chat, and further contact methods such as email and phone numbers. Live Chat is generally the best method to get any issues sorted out quickly, and Casino Cruise operate their Live chat facility from 8:00 GMT till midnight daily. As far as deposit and withdrawal methods are concerned there is a multitude of options including Visa, Master Card, Maestro, Neteller, Skrill, Ecocard, Pay Safe Card, Bank Transfer and several other options available to players. Overall, Casino Cruise is a very solid online casino that has a great ranges of slots, some amazing welcome bonuses, and many on-going promotions for existing players that reward your loyalty to the casino.